Feline Stomatitis has been investigated by animal dentists for over twenty-five years. The etiology of this very painful pathology has yet to be determined. It has been, universally, recognized as one of the most painful oral conditions in the feline. The classic treatment for it in general practice has revolved around the usage of corticosteroids and antibiotics to suppress the immune response and treat soft tissue infection-inflammation. The treatment by surgeons and animal dentists, for the last 20 years, after the completion of oral radiology and histopathology diagnostics, has been whole mouth extraction or extraction of all teeth distal to the canine teeth. 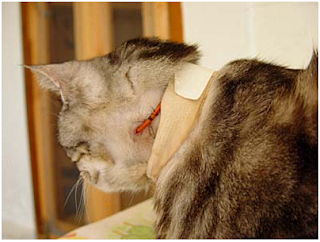 Only half of the felines with this type of extraction surgery reach full recovery. Depending on the author, 4-5 patients out of each 10 felines treated with whole mouth extraction revert to some degree of the oral inflammatory state within 6-18 months post-surgery. As a treatment alternative, Feline Stomatitis Radiowave Radiosurgery-Guided Bone Regeneration has been developed by Dr. DeForge. It completely and permanently reverses the oral inflammation and pain evidenced in feline stomatitis patients. Feline Stomatitis [FS], the most painful oral disease in the feline, has many faces and names. It is the most misunderstood, frustrating, and refractive of all feline oral conditions seen by the general practitioner as well as the oral specialist. As noted, it has been studied in detail by many researchers over the last twenty five years and its etiology is still unknown. FS has many pseudonyms depending on the author who is referencing the pathology. It has been coined Lymphocytic Plasmacytic Stomatitis, Gingivostomatitis, Immune Mediated Feline Refractory Stomatitis, and Feline Generalized Oral Inflammatory Disease. The histopathology of oral biopsies in these cats evidences a predominance of plasma cells, lymphocytes, and neutrophils. A polyclonal gammopathy is commonly noted. The name of the disease is not as significant as the pain that is caused by this disease. Feline Stomatitis [FS] produces a chronic non-responsive generalized oral pain affecting the gingiva, mucosa, palate, lingual and lingual-sublingual area; the glosso-pharyngeal arches; the commissures; and entire pharynx. Depending on the feline, all mentioned or site-specific pathology centers can be identified. The inflammation is progressive. There is no successful medical treatment for this disease. The inflammation can be hidden with glucocorticoids, immunosuppressants, herbs, gold salts, antibiotics, analgesics, vitamins, probiotics, local topical anesthetics, salicylate therapy, and multiple anti-inflammatory protocols. None are effective in the long term. Most often the pain relief is short lived while on these medicines and discomfort quickly returns. Laser therapy is controversial in feline stomatitis and is not recommended by this author. Airway blockage caused by laser usage in the distal pharynx can lead to respiratory embarrassment or patient loss. In the J Vet Dent 24(4);240-249, 2007-J. Lewis, A Tsugawa, & A Reiter-[Use of C02 Laser as an Adjunctive Treatment for Caudal Stomatitis in a Cat] inclusion of a case report in which the laser was utilized and states: "It is difficult to determine what role the laser treatment played in resolution of the inflammation, especially after extraction of the remaining canine teeth performed at the fourth and last ablative laser treatment." Three sub-groups of FS have been identified by this author. Juvenile [4 months to 18 months]; Adult onset 18 months to 10 years; and Geriatric or Late Onset [10 to 20+ years]. A monomicrobial form of oral inflammatory disease, in very young felines, affecting the gingiva and moving into the alveolar mucosa at the mucogingival junction has been identified. It is seen in Bartonella positive felines. Many young Bartonella positive felines, less than a year old, with a specific sub-type of feline oral inflammatory disease, most often, will respond to Azithromycin therapy as described by William D. Hardy, Jr, VMD at the National Veterinary Labs [info@natvetlab.com]. Dr. Hardy states, "veterinarians should consider Bartonella in their differential diagnosis as the etiologic agent for a subset of cats with oral inflammatory disease." Dr. Bill Hardy is to be recognized for his important clinical investigations into the study of Bartonella in cats and the multiple pathologies that they can cause. He is to be applauded for the information he has brought to feline medicine in this New Millennium through the Feline Bartonella test he has innovated. If a young patient, less than one year, that is Bartonella positive does not respond to Azithromycin therapy, it is most likely Juvenile FS and should be referred to an oral specialist/dentist/surgeon for diagnosis and treatment. It must be emphasized that this author does not feel that Bartonella is the etiologic agent for FS. Azithromycin does definitely reverse some, oral inflammatory disease patients under twelve months of age that are Bartonella positive. In older Bartonella positive felines that have FS, treatment with Azithromycin does not help reverse the pathology. The main characteristics of all age groups are advanced oral inflammation and severe pain. No veterinarian should rely on corticosteroids and antibiotics as the treatment protocol for these felines. It is non-productive, does not help the patient in the long-term, and most importantly can predispose the patient to systemic pathology. This author sees many cases of FS that have been treated for years with corticosteroid therapy with adrenal disease, liver disease, kidney disease, and transient diabetes. Others present with septic oral pathology that has been influenced by the immune system being suppressed by glucocorticoids. Some patients with long-term FS are very aggressive, when presented, because of the long-term pain that they have experienced. The owners comment that not only mouth pain aggression is present but relate that they can be attacked by their cat at home at any moment. Many of these cats had been gentle and well socialized before developing FS. It is not uncommon to also see in advanced FS patients: dehydration, cachexia, and anorexia. Diagnosis of FS is accomplished with biopsy and histopathology. The practitioner must never confuse FS with Squamous Cell Carcinoma [SCC] or any other oral neoplasia in the feline. Biopsy must be deep and representative of the pathology. Superficial biopsies are useless to the histopathologist. This author recommends both soft tissue and bone biopsy specimens be sent to an oral histopathologist for examination. Whether for biopsy or for surgical treatment, all FS felines should be scrutinized for other existing non-related medical problems. This is done by an Internal Medicine Specialist. Feline Leukemia testing should be repeated if not performed within the last year in all age groups. A Feline Immunodeficiency Virus test-i.e. Western Blot at National Veterinary Labs is recommended. 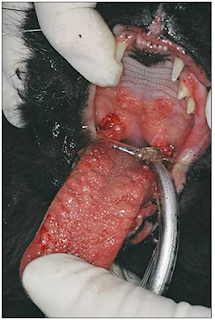 The owner must be warned that recovery from stomatitis surgery is delayed in FIV+ Felines. Feline Leukemia Elisa positive cats should be evaluated with a Fluorescent Antibody test by an Internal Medicine Specialist. Surgery is not recommended in Leukemia + felines. If there is a question of ANY complicating health issue, contact an Internal Medicine Specialist before proceeding. A Feline Bartonella test is accomplished prior to surgery for all felines-Dr. DeForge recommends the Western Blot Bartonella Test at National Veterinary Labs. As stated earlier, it is this author's opinion, Bartonella disease is not the cause of FS and FS patients cannot be successfully treated with Azithromycin. It is recommended to test FS cats and treat the Bartonella positives, with Azithromycin. Because of the public health significance of a Feline Bartonella positive feline’s presence in the home, with oral oozing sores and ulcers in the mouth, treatment is encouraged. Mixed pathology is found in the FS patient. Feline Eosinophilic Granuloma Complex, external and internal root resorption, root ankylosis, and bone changes can all be present. The soft tissue changes are the most extreme with ulcerated sites that bleed readily when being examined. In many FS patients, the attached gingiva, under general inhalation anesthesia, can be peeled back from the tooth and bone as easily as peeling a banana. Dr. DeForge’s studies have confirmed that FS is not a disease of the dentition but is a disease of bone. A polymicrobial bone pathology is suspected. A grant for bone culture and tissue culture is being sought to confirm FS etiology. Feline Stomatitis-Oral Radiology and Histopathology: Characteristic changes are noted in the bone, utilizing digital oral radiology, in all age groups of FS patients. The pathologist in FS soft tissue biopsies will describe an inflammatory infiltrate composed primarily of plasma cells, neutrophils, and lymphocytes. The fact that all patients respond to aggressive osseous surgery sheds new light on a bone origin of FS. If FS pathology was of a dental origin, ALL patients would fully respond to whole mouth exodontia. This is not the case. Only half of the FS patients respond fully to exodontia with a complete and permanent resolution of the inflammation. Feline Stomatitis Radiowave Radiosurgery coupled with Guided Bone Regeneration can successfully treat any feline with FS and reverse the pathology so that the patient has a pain free quality of life. FSRWRS-GBR is a surgery of bone. It utilizes oral digital radiology to identify areas of sclerosing osteomyelitis, condensing osteitis, sclerotic alveolar crestal bone loss, and hypertrophic bone reaction with resorption. Once the pathology is identified, Radiowave Radiosurgery [Ellman International-www.ellman.com] is utilized, to incise all soft tissue and expose the pathology, identified earlier with digital radiology. Using the fully filtered rectified waveform, Radiowave Radiosurgery produces a blood-free atraumatic surgical field that allows visualization of the bone pathology to be treated. There is an antibiotic protocol after surgery to eliminate the osteomyelitis that cannot be surgically treated because of proximity to vital anatomy. Pain control is paramount intra-operatory and post-operatory. The pain presence is not, primarily, from the surgery itself but is from the oral inflammation and ulcerations present pre-surgery. Contrary to past belief, this new surgery technique has shown that all abnormal soft tissue does not need to be removed at the time of surgery. The inflammation, in soft tissue, quickly resolves once the osseous surgery is completed. Any Feline Stomatitis edentulous feline who has experienced complete exodontia by a qualified surgeon or animal dentist with return of the oral inflammatory disease can be successfully treated with Feline Stomatitis Radiowave Radiosurgery-GBR. This proves that FS is not a dental disease but a bone disease. What remains to be shown is the identity of the proposed polymicrobial system in the bone initiating the immune-related oral inflammation. An Internal Medicine doctor must examine your cat and clear your cat for General Inhalation Anesthesia for Stomatitis Surgery. That same Internal Medicine doctor must place a feeding tube-i.e. Esophagostomy tube- two weeks prior to Part One of the Stomatitis Surgery at the time of your pre-anesthesia testing. Alternative pre-anesthesia testing can be performed by Dr. DeForge. If pre-anesthesia testing is performed by your LDVM, a Clearance for Anesthesia letter must be signed and provided by your LDVM to Dr. DeForge. All chest x-rays must be reviewed by a radiologist. All sonograms, if indicated, must be performed by a specialist. All ECG’s must be computer interpreted or reviewed by a specialist prior to anesthesia. The Surgery with bone grafting is completed in two parts each two weeks apart. Dr. DeForge works on ½ of the mouth in each visit. Each surgery is 2 hours long. The patient is discharged the same day of the surgery. There must be a caretaker that is able to follow the instructions on the usage of the E-Tube for feeding formula after surgery and giving medicines to the patient after surgery. All medicines are given in the E-Tube until about one week after the second surgery. The E-Tube flushing-maintenance is essential to prevent the tube becoming clogged. Medicines and Histopathology Biopsy Lab fees are additional to the above estimate. You must purchase an E-Collar and a vest harness for your cat prior to the surgery and bring it with you to our center the day of surgery. We zip-tie the E-Collar to the harness to protect the E-Tube and to stop the patient from traumatizing the surgery after it is completed. You must have a large breed dog crate to keep the patient confined in while the surgery period is active. After the E-Tube is removed.[i.e. two weeks after the second surgery the large breed dog crate is discontinued] A cat with an E-Tube can dislodge the E-Tube even with an E-Collar in place if given free roam of the home. A veterinarian must change the dressing covering the E-Tube weekly. The E-Collar must be kept clean daily. It is especially important to clean after eating-this will be explained on discharge. All foods are blenderized. No blenderized foods can be given for 72 hours after each surgery. That is a time ONLY for Tube Feeding with Ensure Vanilla Formula to allow the mouth to heal. There will be a complete set of discharge instruction post-surgery. All medicines are compounded by RoadRunner Pharmacy into a triple tuna liquid. These are first given by E-Tube. When the E-Tube is removed they are able to be mixed in Fancy Feast Primavera or Florentine canned food varieties-tuna or salmon. Schedule a pre-surgery consult with Dr. DeForge. He will order the prescriptions for you at that time. For this consult there must be a 12 hour food fast and a 6 hour water fast in case Dr. DeForge wants to give a mild sedative to examine the mouth. After the first month post-surgery, antibiotics are pulsed two weeks out of each month for 6 months. This is to reduce residual infection in the oral cavity. After that time no medicines are needed. Thank you for allowing me to help in the removal of Cat Stomatitis from the member of your family that you love. In conclusion, Guided Bone Regeneration Stomatitis Surgery in the cat is not for everyone. The care of an E-Tube must be meticulous. Medicines are given for 90 days post surgery. A large/giant breed dog crate must be established for confinement during this period. It is a comfortable home and not an isolation unit for 90 days. You must visit, hold, and show love to your pet during this important 3 month post-surgery period. Cat GBR Stomatitis Surgery is not a surgery for outdoor cats. It is not a surgery for cats with other medical problems that may have secondary and not primary cat stomatitis. It is a journey. A journey well worth the completion……. but a journey that is positive ONLY with a hope and belief in a positive outcome. With attendance to all that is recommended, your cat will have a wonderful life. Do not go into the surgery without realizing it requires effort and work on your part to be successful. Dr. DeForge is the surgeon but the family and Dr. DeForge are the primary pet advocates. Without listening, communicating, and working together success and pain relief will not occur.